I spraypainted Scott Williams’s huge gorilla on the back door of CELL.in 2010. It is gone (as is the piece that replaced it) due to tagging. Almost to the day today, I arrived in San Francisco in 1997 with two suitcases (one full of camping gear) and a vague idea of what I wanted to accomplish in the City by the Bay. The words that kept bouncing around in my head were: diversity, creativity, and adventure. I had no idea there as a dot com boom and that the vacancy rate was under 1%. I didn’t even know what a vacancy rate was! I did know that I wanted to be part of something amazing, and if possible, somehow create amazing cultural bits that others enjoyed. In 1998, I started volunteering for CELLspace, which at the time was a funky underground artist warehouse with folks who had a similar vision that the one I was chewing on. Years later, I tried to move on and open my time and life up to other amazing projects. So CELL got put on the backburner, until 2008. That was a crucial year for CELL, now a nonprofit with paid employees. While on the road touring for the book and for the Conscious Carnival, word started getting back to me that CELL was financially imploding. I wasn’t surprised. 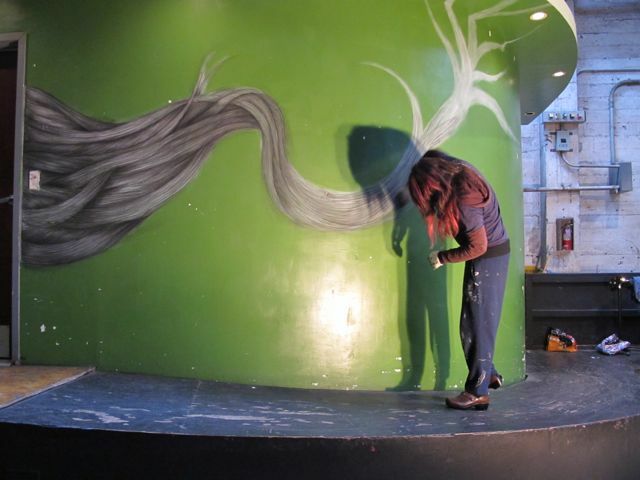 Over the past week, Paz de la Calzada brought her charcoal to CELL and drew on the curved green wall in the Main Space. She has been drawing strands and I got to know her down on Market Street at her charcoal piece on The Strand Theater (which was recently purchased by ACT and will become a 300 seat house for shows that are too small for their Geary theater). Paz was not working these past few weeks, so she gave her talents and vision to CELL for free. This is really the only way I can get art on the walls at Bryant Street. I do it for the love and others seem to be into sharing it for their love as well. Paz did the interior piece in a day. Today, before SpaceCraft, she showed up with a charcoal drawing on paper. I hauled out the tall ladder and she climbed up and pasted it on the wall near 2060 Bryant (ACT’s prop shop). It is small and delicate: tiny strands coming out of the brickwork. 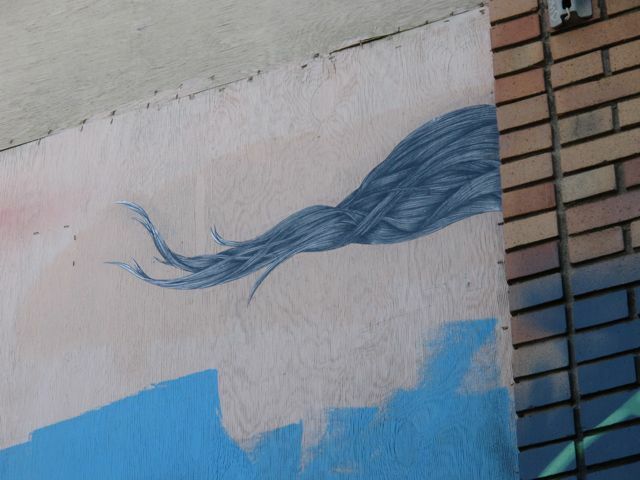 It will only be noticed by people who look for art surprises in urban space. Might be you! Paz added a charcoal piece on paper to CELL’s facade. Paz works on the charcoal piece in CELL’s interior. 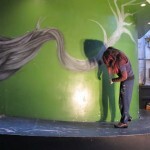 My mural curating continues in 2012. Late last week I had three meetings about three different murals. 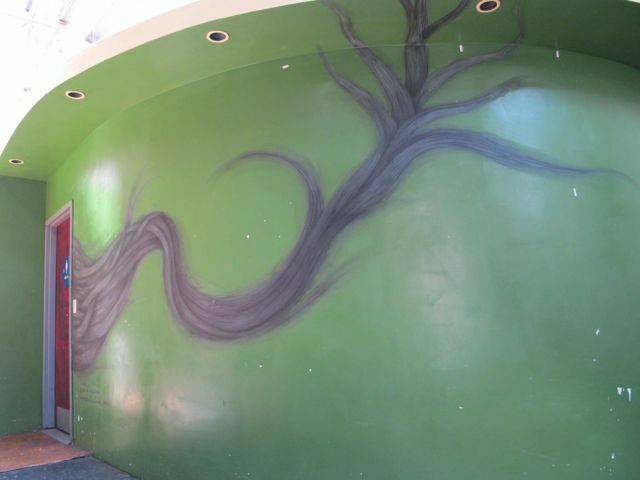 I also have been in contact with Dia, the artist who painted the “Liberty” mural (now for sale) as well as the “Dia del Toro” mural over on the ACT shop entrance. 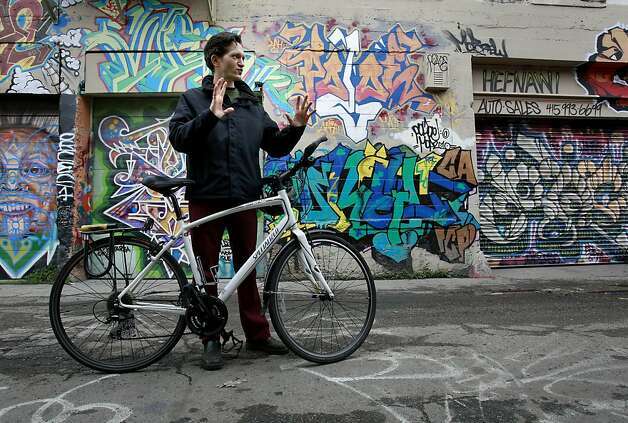 Dia is going to paint a new mural at the ACT spot as soon as the weather cooperates. 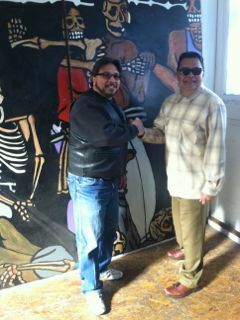 Last Thursday, I met with Ray Balberan and artist Carlos Gonzalez. Mentioned in an earlier post, several panels from the 1980s RAP mural “Education is Liberation” magically appeared in the back of CELL. I took the panels, contacted the journalist at Mission Loc@l, and Ray finally met with me and Gonzalez to pick up the panels. Ray and Carlos were extremely happy to see the panels. Most of what has been found show gang banger skeletons committing violence. Though the message was education is the way out of the hood, the art is still quite powerful and a historical representation of the Mission District in the 80s. Then I met with Paz de la Calzada to discuss her painting at a few spots at CELL. 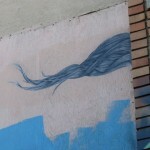 She will paint either wisps of hair or roots on the curved wall of the women’s bathroom as well as somewhere on the exterior walls of CELL (possibly the sidewalks). Then I met with Cy Wagoner to discuss the continued concept of the Native American themed wall at the 2048 Bryant entrance. I think we have an idea of how to move forward on this. The mural will possibly incorporate stencil, wheatpasted paper, free spray, and maybe other styles. If the rain ever stops. 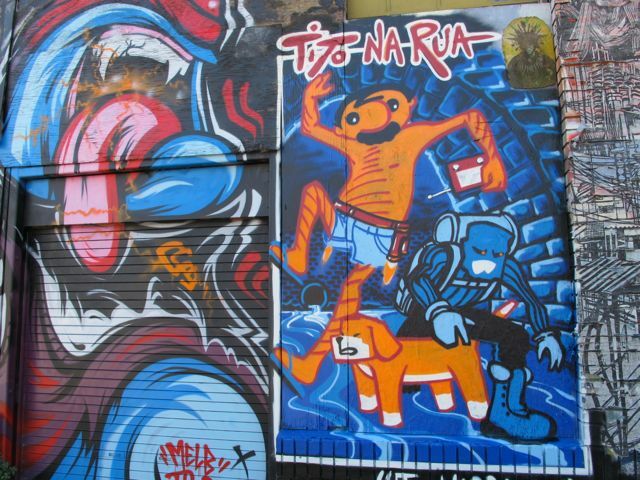 Finally, Tito na Rua from Rio, Brazil stayed briefly at 2048. He does great street comics on walls. The Vexta stencil had been defaced by a tag, so I had Tito spray up his characters next to Meggs’s crazy SF monster. Looks great. 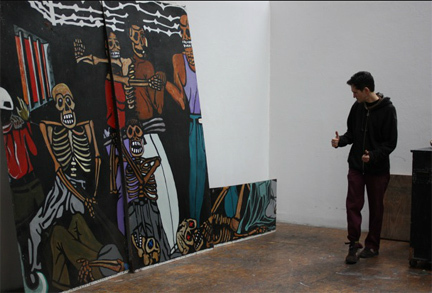 Artist Russell Howze isn’t sure how they got to Cell Space, but five more pieces of a historic mural series appeared at the art collective on Monday and will be turned over to its caretakers. Sunday Streets was a great time on 19th and Valencia. 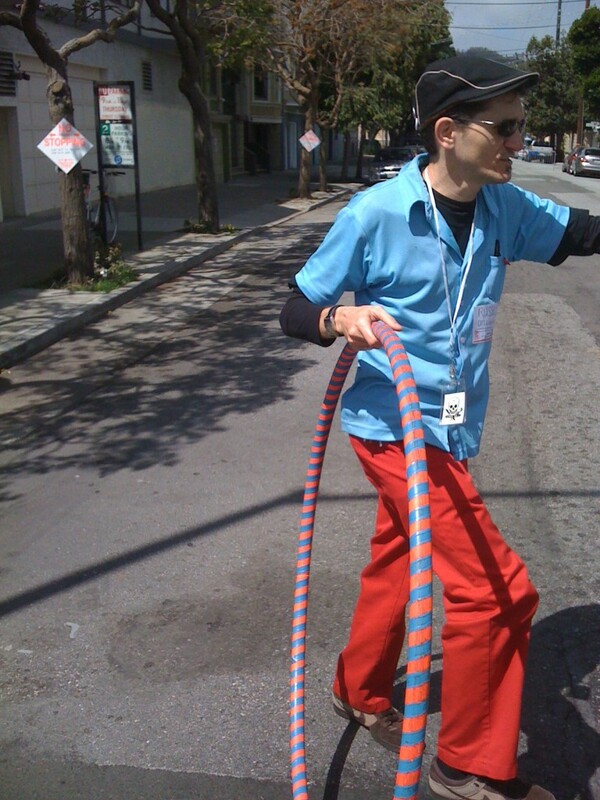 I barely saw any other part of the event, but managed to hula hoop more than ever in my life. Got the hang of it and then started another trick. Will have to work on it next time. Bay Area Hoopers really filled out CELL’s area. We had maybe 15 hoopers at the most, many of them children who couldn’t resist trying it out. I didn’t realize that BAH has been spending wet season at CELLspace for 8 years now! Laura baked cookies and lemon squares for Sat. night’s Funkathon, so we had the extras to hand out and try to sell. I tried to get a Funky Puppet Supper reunion together for the day, but it just didn’t happen. The most committed alum, Nate Holguin, had to work an emergency shift at the Brava Theater. A few others alums stopped by to say hey and hang out. After running an errand, I finally made it over to CELLspace for the birthday bbq. Dave X had several grills going, and Antonio and some of the hoopers had beaten me there. Nate was there, so I was glad to get to catch up with him after a long time of no seeing. Ben Smith, an early co-founder of CELLspace, stopped by as did several folks who saw the bbq advertised online. Soft, a former caretaker, just happened to be biking by, so he stopped for a burger and some hanging out. Photographer Steve Rhodes showed up too. 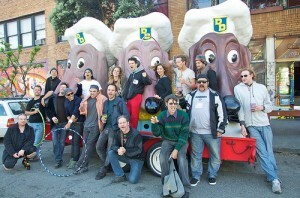 When Dave saw his camera, he asked if Steve could take a group photo by the Doggie Diner Heads. And he did. 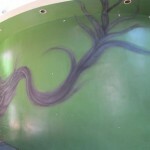 You can see them all here, along with some other photographs of the murals and Jeremy Novy’s latest additions. Right before I left for my 7pm appointment, CELL’s birthday cake was cut and being consumed. For some of the group shots, we sang “happy birthday” to CELL and then gave a hearty pirate “arrrrgh!” If you care to know, back in the CELLspace days of collective meetings, we approved all passed agenda items with a loud “arrrgh!” Makes sense that the crowd at the bbq was more into the scream than the banal birthday song.